Yup, you read it right: I'm heading back to first grade this year!!! And I am super, SUPER excited!!!!! I have a TON of work to do before September 4th. I can't wait to add color and organize and make it feel like home! :) Be sure to check back with me over the next few weeks to see what I turn it into!!! Cute room! Can't wait to see how it looks after you finish decorating. Where did you find the photo mat? I want to make something similar but not sure where to start. That is one snazzy floor! Congrats on teaching 1st again. It's difficult to become proficient at a grade level when "they" keep on moving you around like that! I've been teaching 1st for 8 years and I still feel like a newbie sometimes. I'm sure your room will look beautiful before September 4! Can't wait to see what you do. I love the frame, I want to make one too! I've also switched a bunch. First grade 2 years, then kinder, now 3rd. I'll probably be staying where I'm at for a while, too! Bless you for being so calm about switching grade levels so many times! That is a challenge! I hope this spot will be your permanent spot! 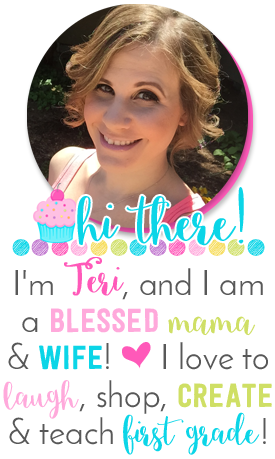 Your frame is really, really cute; your students will love it! I can't wait to see what you do in your new room! welcome back to first! :) they'll be so happy to have you! Welcome to FIRST GRADE :) So excited for you!! 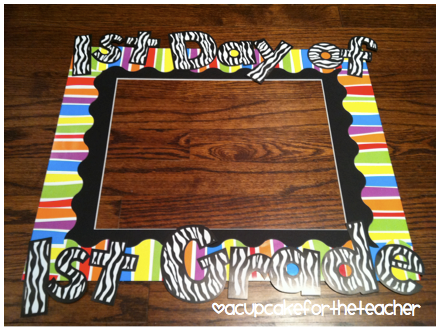 Love the frame ;-) it was definitely a cute thing to do on their first day of school! I love your frame! What did you use to keep the border and letters on it? Love that frame!!! I want to make one. Yeah, for you! I love the frame...my husband just made mine and I was going to start decorating. I'm glad I saw yours because I never thought of using border on it! Seriously cute! Yay for your first day in your new classroom!! 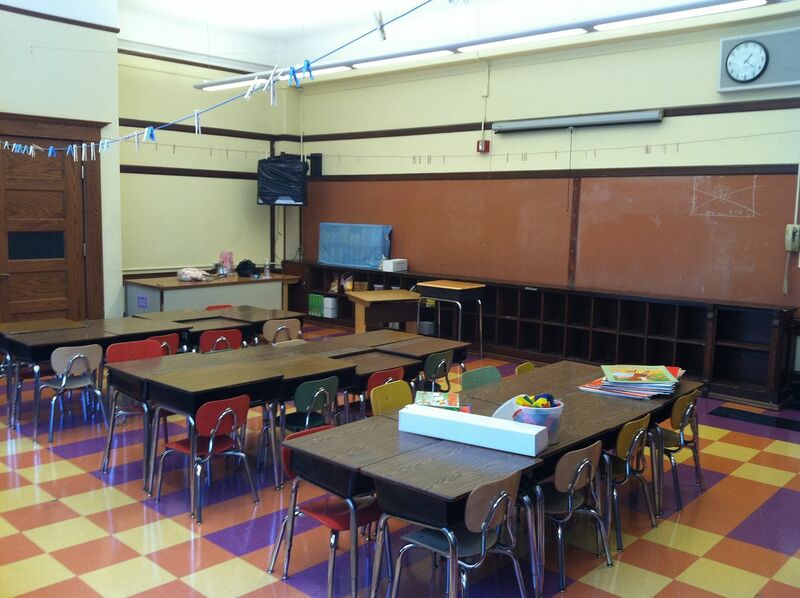 It is not a good feeling to see the classroom at the end of summer and all the work that needs to be done to get it ready for the kiddos!! It's fun decorating, but so much work!! It always takes me a lot longer than I expect!! haha good luck getting it all done though, I can't wait to see how it turns out!! And your photo frame is super cute!! I love the photo frame and the floors in your new room! Totally can't wait to see what you turn it into! :) It's gonna be adorable I'm sure!! Are you taking orders from followers; I would love one for me classroom/students :>) Smiles and stop by anytime!!! So glad to hear you are headed back to first! There is something about first that is super special. I can't wait to see how you transform your new space. Congrats!!! We're both in 1st! Yay! Your frame looks adorable!! I am sure that you will have your room whipped into shape soon and it will look awesome!! Good luck in first!! Yay! I love 1st grade! SUPER CUTE frame!! Love it! I'm a new follower! Im a new follower of yours and for some reason I can't see your pictures! YIKES! Sixth grade?! I can't imagine teaching sixth! 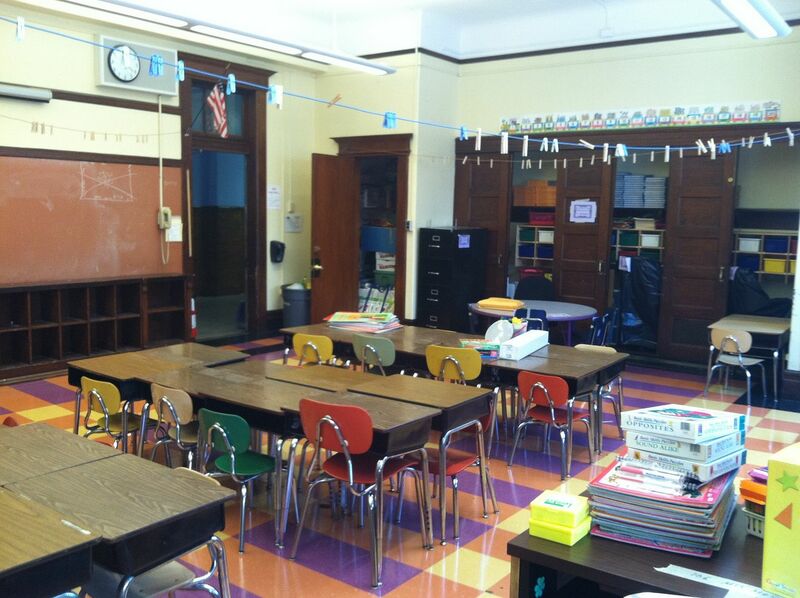 I can't wait to see your new firstie classroom! Congrats on being back in first. Love that floor. I can't wait to see what you do with your room!